Logins this hour: 19866 ? 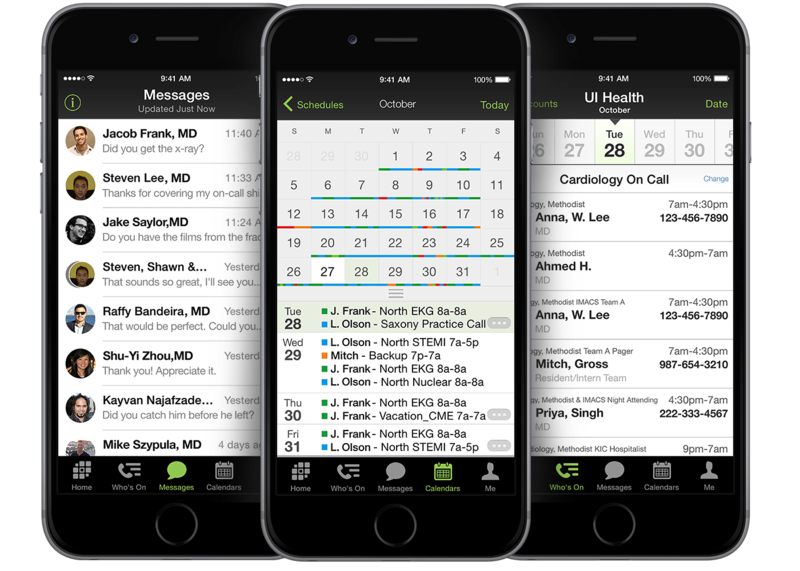 OnCall generates call, shift and clinic tally reports. You can view the reports, copy them to excel, and track tallies while entering your monthly schedule. In the OnCall icon toolbar, select the Statistics, icon. If using the residency platform, select the data you want to tally from the drop-down box in the upper left corner. First select to tally the # of shifts or # of hours. Then select to tally by day or by service (and if applicable, by target). Lastly, select the date range for the tally report. You may tally across calendar years too. The Day report tallies by day of the week for the period selected and displays shifts or hours worked for weekdays, weekends, holidays, and nights. If tally weights have been set up in your schedule, these are displayed in the Point column on the far right of table. The Service report displays tallies by services - your call, shift and clinic schedules - showing a total of hours or shifts for the period selected. The service report also tallies off-schedule services such as Vacation, CME, Sick, etc. The Target report (applicable if you have set up workload targets for your staff) shows target and actual tallies for the month and full year. 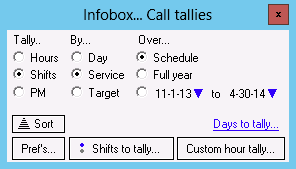 The infobox call tallies window offers additional options such as tally preferences and deselecting shifts or days of the week from your report. To edit the tally report in Excel, go to Edit / Copy table as text, then open Excel and click paste. Schedules built manually or using the autoscheduler typically need some fine-tuning. Many groups look at the statistics page (tally report) to ensure fairness, and then manually adjust a few assignments in their schedule to improve the balance. While on the tally page, you can also click and drag a number from one row to another to take a shift from someone who has a heavier workload and give it to someone who's on the low side. The auto-scheduler looks over the tally period to find the best shift to give to the other person. To track tallies as you create a schedule, select a day in your schedule. In the infobox window listing available staff, select the tally, icon. Black dot markers will appear to the right of staff names. The first column of black markers is the # of shifts or hours your staff are already scheduled to work for the month. The 2nd column is the # of shifts worked for the year so far. If workload targets are set up for your staff, the tally column will track # worked vs. target #. For additional tally options, right-click on tally icon in infobox window. In OnCall, go to File > Preferences and select Call Tallies, 2. If enabled, the option to count overnight shifts towards the next day will give a provider an 'extra' number of shifts in the tally totals when you see one less assignment on the schedule for those days. Let the software know which shifts should count in the night tally by selecting the appropriate time below the 'night tally includes shifts . . .' section. Example: On September 8th, Dr. Smith is on 'Evening Call' from 3:30 - 11:30 pm. In the Call Tallies, 2 section of the Preferences window, you have the night tally set to include shifts that begin before midnight and end at or after 11:00 pm. The 'Evening Call' shift that Dr. Smith is assigned to thus counts as a night and is getting added to the tally that starts on September 9th. Here we discuss tally. This page describes statistics.